The American Ground Water Trust recognizes the national importance of developing energy supply from the huge inventory of geologic resources that occur in many parts of the US. The private sector energy industry plays a critical role in virtually every aspect of the nation’s economy. We believe that the techniques used to bring fossil fuels to the surface should cause no damage to the environment. In addition, the storage, handling, and treatment of fuels, chemicals and process water, and the transport of extracted fuels by truck or pipeline, should be undertaken in ways that minimize disruption to communities, and do not jeopardize surface or groundwater resources. We need sustainable uncontaminated water and the development of fossil energy. We can have both, provided science, technology, common sense, regulatory oversight and caution are applied during exploration, development, operation and closure. As an education organization, the American Ground Water Trust will pursue the role of providing balanced information, and facilitating information exchange to help reduce and remove angst and conflict among all parties interested in, and affected by, the development of natural gas. We believe that water resources, like fossil fuels, have an economic value and that citizens should have an opportunity, and that they have a responsibility, to participate by way of informed debate in the development of water & energy policy-decisions that may affect them. Click on the links below for more information about hydraulic fracturing, the development of natural gas and citizen concerns about potential threats to water resources. Why do we need to develop natural gas? Who has authority in your area? Hydraulic fracture techniques are used in the development of shale gas and coal-bed methane. The ―fracking‖ process uses water to which various chemicals, compounds and proppants are added and are then pumped under pressure via directionally drilled long horizontal bores to liberate natural gas from underlying rock formations as much as 10,000 feet beneath the land surface. Hydraulic fracturing, which may be performed multiple times during the life of a gas well, needs water. When the gas & water returns to the surface there, may be impaired water quality impacted by rock chemistry and the complex additives used in the ―fracking‖ process. Some of his ―impaired‖ water can be treated on-site and reused. Excess return water may be piped or trucked to nearby municipal water treatment plants. The rising cost of petroleum on international markets, the drive to achieve greater energy independence, and the effectiveness of hydraulic fracturing techniques, have made a huge difference to energy extraction economics. Geologic areas such as the Barnett Shales in Texas, the Marcellus Shales in Pennsylvania and New York and in areas such as the Powder River Basin in Montana and Wyoming have experienced rapid expansion of energy extraction. The development of gas wells, now over 500,000 of them in the US, has in places overwhelmed local waste-water treatment capacity and has resulted in some instances of ground water and surface water contamination. At the core of the America Ground Water Trust’s education programs is the objective of informing citizens, communities and decision-makers on how to better use and protect groundwater. Water policy decisions should be based on sound, scientific evidence and should take a long term perspective on the economic and environmental VALUE of groundwater. We believe that the indiscriminate use of the terms hydraulic fracture and hydrofracture, often used interchangeably, is causing confusion. We recommend that the term hydraulic fracture be used specifically for the process used by the energy industry to enhance gas production and that hydrofracture (one word or two) be used specifically for the process used by the groundwater industry to increase inflow to low-yielding bedrock water wells. The differences are illustrated in the PowerPoint. The American Ground Water Trust receives phone calls and e-mails from citizens in many different states that express concern about various aspects of the actual or potential effects of energy development in their community. While we have no quantified data about the issues that are most prominent, it is very apparent that water quality and water reliability are major concerns for people in areas underlain by shales that are in development now, or for which gas development may occur in the future. People in rural areas who are dependent on individual on-site wells have particular worries about impacts on water quality, with gas migration a concern that is often mentioned. The ―public‖ seems to use the term ―fracking‖ to cover any and all aspects of energy development and their definition is much wider than the specific sub-surface hydraulic process. It seems not to matter whether problems (real or imagined) are related to chemical or fuel storage, pipeline transport, vertical well integrity, noise, light pollution, traffic density or methane releases. The whole gamut of concerns is generally incorporated as concern about the effects of ―fracking.‖ While some citizens certainly welcome the energy industry and recognize the need for energy development, there is a strong current of NIMBY (not in my back yard) about the energy industry, particularly in parts of the country where citizens have previously had limited exposure to oil, gas or coal operations. The series of pictures in the PowerPoint serves to illustrate the range of concerns that have been expressed to us about energy development..
Communities and citizens in areas where there are undeveloped natural gas reserves or already existing natural gas wells, need to be properly informed and educated about energy development. In addition to awareness of the national benefits and the impacts on the local economy, citizens will benefit from understanding the basic exploration, development and operation procedures involved in gas recovery. Awareness of the processes and protocols used by the energy industry will help citizens more objectively assess potential risks to the environment, water sources and/or their quality of life resulting from operations in their local community. Of particular importance is the collection of accurate pre-development base-line data, particularly for water quality, so that if concerns arise, science can be the basis for unraveling cause-and-effect. The following PowerPoint lists some general points and questions for which the public should have answers. 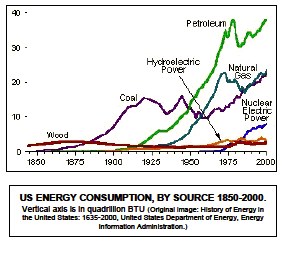 Over the last 200 years the sources used for energy in the US have changed. New technologies and increasing demands have resulted in changes in the proportions of energy from different sources. In 1800 about 95% of energy needs were from wood or from animal feed. By 1885 the rise of the coal industry resulted in a 50/50 split between wood and coal sources and by 1914, 75% of America’s energy was from coal. By the 1950’s coal was passed by petroleum and natural gas as the main energy source. The graph shows how energy consumption has increased and how the proportions from different sources have changed. By 2010, just over 10% of US energy was from the renewable sources of hydroelectric, wind and solar power. (US Energy Information Administration, Electric Power Monthly, June 2010). The US population is increasing by 7,000 people a day and with apparent climate changes bringing more hot & cold extremes there is likely to be an ever increasing demand for energy production. Natural gas reserves in the US are enormous and the development of shale gas in many states will reduce dependence on imported fossil fuels, and avoid high foreign exchange costs. There have been many citizen protests about hydraulic fracturing in areas where the process has begun or has been proposed. Very often the principal concern articulated in the protests & demonstrations is for the preservation of water quality and environmental quality. The selection of pictures in the PowerPoint has been taken from the internet simply to illustrate the wide geographic extent of citizen concerns. We do not have case-by case information about the validity of these specific protests. We do however believe that in some instances, lack of information and lack of knowledge of the process and procedures for developing and operating the energy resource is part of the reason for protest. While there may possibly be some instances of activist and rent-a-crowd activity, we believe that the extent and the persistence of the protests and demonstrations shows a genuine grass-roots concern about environmental issues. While the instances of reported problems may be very tiny in relation to the number of gas wells constructed, there is clearly a need to take every technical and regulatory measure possible to minimize risk from gas wells, with a cradle-to-grave responsibility for restoration and remediation resting on those who are developing and operating the gas wells. Citizens need to recognize the critical role of energy in our economy and the historical and present-day reality that the private-sector is the energy provider. Energy companies need to recognize the very reasonable expectation of citizens that their communities and environment will not be negatively affected by energy development. Transparency in political decisions, awareness of the extent and limitations of science and technology, freely available objective information, information exchange, and opportunities for citizens to participate in developing policy that affects them, are key ingredients to successful compromise. The PowerPoint slides give a selection of comments from industry leaders, politicians and other involved in the debate about hydrofracture. (A small selection of freely available information is listed below. The issue of hydraulic fracturing has raised many concerns from the public as well as government officials. This paper will review the history and evolution of hydraulic fracturing, including environmental and regulatory considerations. Additionally, technical and environmental considerations will be presented applicable to hydraulic fracturing in the unconventional arena of gas shales with an emphasis on the Marcellus Shale of the Appalachians. Topics addressed in the paper will include discussion on why hydraulic fracturing is performed; the hydraulic fracturing process; applicable design and engineering aspects of well completions; geological considerations such as confinement of the fracturing process; potential risks to groundwater and underground sources of drinking water; and the use of hydraulic fracturing fluids and associated technical considerations. Shale gas reservoir developments are a growing source of natural gas reserves across the United States. The successful model used for gas shale development in the Barnett Shale of the Fort Worth Basin is being expanded to other shale plays. The basis of the Barnett Shale completion model is the use of horizontal wells and hydraulic fracturing stimulations. One shale gas play that is currently in the early stages of development is the Marcellus Shale of the Appalachian Basin. The Marcellus Shale has the potential to be one of the largest natural gas plays in the United States and is the focus for the discussion in this paper. While the development of the Marcellus Shale is in the early stages, the use of horizontal well drilling and hydraulic fracturing appear to be key aspects of successfully developing this important natural gas resource. This paper is a review of the hydraulic fracture process, including a brief history of hydraulic fracturing as applied to shales and the activities associated with a hydraulic fracture treatment. Unconventional development of energy resource plays, including coal beds, tight sands and shales has been a growing source of natural gas development in the United States. Since 1998 unconventional natural gas production has increased nearly 65%. This increase has resulted in unconventional production becoming an increasingly larger portion of total natural gas production, increasing from 28% in 1998 to 46% of total natural gas production in 20071. One type of unconventional development that has gained attention and contributed to this increase is natural gas from shale formations. Gas production from gas shales is gaining attention throughout the United States and extends beyond the well known Barnett Shale in the Fort Worth Basin and Fayetteville Shale in the Arkoma Basin. Shale gas resources extend across the continental United States, offering abundant and available access to clean burning natural gas. Development of shale gas resources includes the shales in a variety of basins, including the Devonian shales in the Appalachian Basin; the Mowry shale in the Powder River Basin; the Mancos shale in the Uinta Basin; the Woodford shale in the Ardmore Basin; the Floyd/Neal shale play in the Black Warrior Basin; the Barnett shale in the Permian Basin; the New Albany shale in the Illinois Basin; the Pearsall shale in the Maverick Basin; the Chattanooga shale in Arkansas and Tennessee; the Hovenweep shale in the Paradox Basin; the Bend shale in the Palo Duro Basin; and the Barnett/Woodford shale plays in the Delaware and Marfa Basins. One key shale gas play identified as having promise for future development is the Devonian Aged, Marcellus Shale of the Appalachians2. The development of the Marcellus has been made possible based on recent technological advances in two key technologies – horizontal drilling and hydraulic fracturing3. The technology of horizontal well completions was first adapted for shale gas development to provide increased wellbore exposure to the reservoir area while allowing for a reduced number of surface locations in the urban areas of the Ft. Worth Basin4. Barnett horizontal wells have laterals ranging from 1,500 to more than 5,000 feet and for these wells to be economically productive, they require hydraulic fracturing. Because of well configurations and other considerations, hydraulic fracturing procedures were adapted to the unique Barnett formation’s needs4. Similar well completions and treatments are expected to be necessary for Marcellus Shale wells to be economically productive and to effectively and prudently manage the resource. 1 Navigant Consulting, Inc. 2008, North American Natural Gas Supply Assessment, Prepared for: American Clean Skies Foundation. 2 David Brown. 2007. From Sea to Shining Sea: If It’s Shale, It’s Probably in Play. AAPG Explorer April 04 2007. 3 H. Lee Matthews and Mark Malone. 2007. Stimulation of Gas Shales: They’re All the Same- Right?. SPE 106070. 4 R. Leonard, R. Woodroof, K. Bullard, M. Middlebrook, and R. Wilson. 2007. Barnett Shale Completions: A Method for Assessing New Completion Strategies. SPE 110809. 5 David D. Cramer. Stimulating Unconventional Reservoirs: Lessons Learned, Successful Practices, Areas for Improvement. SPE 114172. 6 Drilling Contractor, 2000. Alabama Lawsuit Poses Threat to Hydraulic Fracturing Across US. January/February 2000. pgs 42-43. Hydrofracking of water wells is different than hydraulic fracturing for oil and gas production. While there are some similarities there are many differences, and the two should not be confused with each other. Our concern now is policymakers may unknowingly link the two practices together under regulations intended to govern the oil and gas industry. Because of their marked differences, please consider a special exemption for water well hydrofracking. We’d welcome the opportunity to work with your office on how to address that exemption legislatively. Hydraulic fracturing began as a process for the stimulation of oil and gas wells, and was first used in the United States in 1947. The procedure was deployed commercially in 1949, and because of its success in increasing production from oil wells, was quickly adopted industry wide. It is now practiced in thousands of oil and gas wells annually. Hydraulic fracturing is a method used to create fractures that extend from a borehole into rock formations, which are typically maintained by a proppant, a material such as grains of sand or other inert substance, which prevents the fractures from closing. The basic concept of hydraulic fracturing was introduced, modified, and adapted for the water well industry in the late ’60s and early ’70s. The hydrofracking of water wells has proven beneficial in areas where water is difficult to locate or extract from underground. Alternatives to hydrofracking available for homeowners in such locations include having multiple wells drilled in hopes of locating a more productive source of supply, or hauling in water. The number of water wells that are hydrofracked annually varies widely among states. For some states, given the geology and groundwater occurrence, no water well hydrofracking is necessary, e.g., Illinois, South Carolina, South Dakota. In other areas, e.g., Michigan, Tennessee, Washington (state), state agencies report an average of 20 to 60 water wells developed via hydrofracking annually. Still other states report that even higher numbers of water well owners depend on hydrofracking to obtain adequate supplies, e.g., Minnesota (150),Wisconsin (300), New Hampshire (543 or about 11 percent of wells drilled are hydrofracked). This report describes hundreds of case studies demonstrating that industrial gas drilling, including horizontal drilling using high-volume hydraulic fracturing, results in significant adverse environmental impacts. These impacts result from changes in land use, roadbuilding, water withdrawals, improper cementing and casing of wells, over-pressurized wells, gas migration from new and abandoned wells, the inability of wastewater treatment plants to treat flowback and produced water, underground injection of brine wastewater, improper erosion and sediment controls, truck traffic, compressor stations, as we ll as accidents and spills. The studies in this report rely exclusively on investigations, findings, and statements of state and federal regulators in the Marcellus Shale region (Pennsylvania, Ohio, and West Virginia), the Barnett Shale (Texas), the Fayetteville Shale (Louisiana and Arkansas), as well as regulators in the western states of Wyoming and Colorado. In the past two years in Pennsylvania, state regulators have found that gas drilling using high-volume hydraulic fracturing has contaminated drinking water, polluted surface waters, polluted air, and contaminated soils. In Ohio, state regulators found that inadequate well casing resulted in drinking water contamination and the explosion of a house. In Texas, state regulators found elevated levels of benzene and other toxics in neighborhoods with nearby gas compressors. In Wyoming, EPA has warned residents not to drink the water, and in Colorado, hundreds of spills have been reported as residents continue to investigate localized health impacts they feel are associated with nearby drilling operations. At a time when the oil & gas industry should be on its best behavior, the industry continues to operate with impunity and lobby against federal regulatory oversight. Even as the impact of the Gulf disaster continues to shine a light on the true costs of deregulation, the industry continues to cut corners at the expense of workers and communities across America. No one debates that the gas industry in the United States has long played a fundamental role in our economy and energy production systems. New York State was the first to embrace the industry in 1821 when the first well was drilled upstate – drilling down vertically into a pool of gas. But the lay of the land is quite different now than when traditional gas drilling first began. More and more shale deposits are now in development as a result of emerging technologies, and an increasing percentage of these developments are in nonconventional shales, areas that were traditionally too difficult or expensive to tap. Hydraulic fracturing, a technology first utilized over 50nyears ago, is now employed at roughly 90% of oil and gas wells in the U.S. But the gas industry has yet to live up to its promise of providing clean energy with minimal environmental impact. Instead of acknowledging risk and undeniable impacts, executives and spokespeople demonize the opposition. Rather than full disclosure, there is secrecy coupled with empty promises of cooperation. This needs to change. In 2009, Riverkeeper submitted a Case Studies report to the New York State Department of Environmental Conservation in an attempt to dispel myths from state regulators and gas industry executives that drilling was always safe and that reports of contamination were inaccurate. This report is an update that highlights some of the environmental impacts that hard working Americans have had to deal with as we strive to work with government agencies and industries to take the lead in creating long-term energy solutions and sustainable economies of scale that do not require the sacrifice of clean air and water. After analyzing reports from state and federal regulators, this report concludes with recommendations that, if fully realized, may help to alleviate some of the problems documented across the country. These recommendations include legislative and regulatory actions that would be necessary in order to prevent and control further environmental contamination. "Fracking” has become the lightning-rod word of choice for the media when ever shale-gas development is in the news, even although the actual deep hydraulic fracture process is rarely if ever to blame for environmental problems. The few incidents that do occur are nearly always related to fluid handling and storage at the surface. 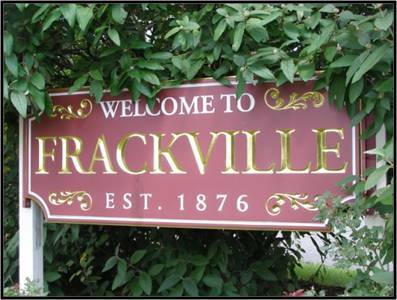 Despite its name, the town of Frackville (population 4,000) 55 miles northeast of Harrisburg, is not the center of hydraulic fracturing activity! This Pennsylvania town (originally a coal mining area) is named for its 19th century founder, Daniel Flack.